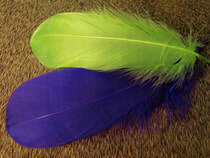 These are all the super select feathers. Each package is full of hand selected feathers weeding out all of the junk. Giving you the highest quality available. Each plume is individually "stripped" prior to dying to insure that each fiber is completely dyed from the tip to the base of the plume. 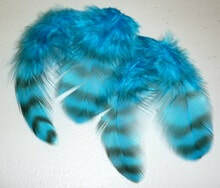 Only premium quality plumes averaging 6" to 7" in length are chosen. 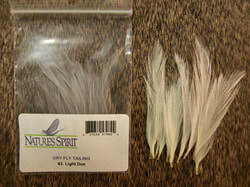 Great for spey collars and marabou streamer wings. Try wrapping a few fibers for nymph gills or bodies. This is one of our best selling products. Ten select plumes per pkg. This is an underused material with much potential. Length varies from three inches up to around twelve inches. Try it for gills on large nymphs, palmer it, or use its for tail and legs on bugs. Gadwall is a larger version of teal flank. With much more defined barring, it gives a stronger presence then mallard flank. 24 feather pack. 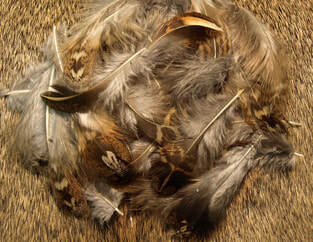 Bronzed mallard is a specialty feather used for matched wings on trout and spey flies. 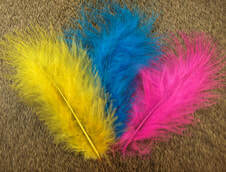 They come in two different packages, a very select 3 pair set and a 24 feather pack. 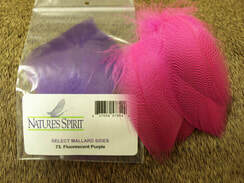 Mallard spey is a very select pack of 12 jumbo feathers. Specifically ​picked to meet the needs of steelhead and salmon fly tiers. This is a 2 gram bag of Mallard flanks reaching around 60 feather a pack. 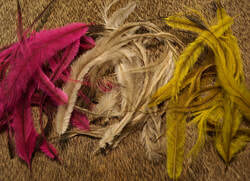 We separate the junk out of the pack so you only get good quality feathers. Sizes are mixed on feathers. This is a 24 select pack of Hen mallard Flank. Wood duck is a prized feather for its unique designs for classic wet flies and spey flies. 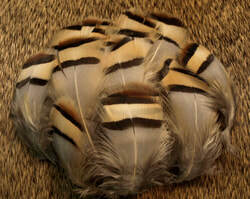 These are the heavily barred black and white feathers. Also listed here is the Lemon Wood Duck. The Teal flanks come is a 24 select pack. Popular for classic wet flies and soft hackles. With heavier barring then mallard flank and being smaller, its fits a nice niche if the fly tying world. 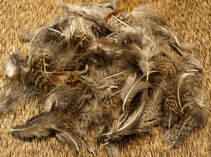 Pintail is not as well known for fly tying as the other more commonly used duck feathers. It is larger than teal with a similar bold marking. The dyed wood duck is really nice. These hand selected feathers are frequently put to use on our own bugs. This is a good sized mix bag of feathers. get a great variety pack that ​including mallard, gadwall, teal, pintail and wood duck. This is our Blue Eared Pheasant replacement. Though not the same feather it is as close as you can get. These come in a 24 select feather pack for your spey needs. Goose Shoulder comes in a 6 feather pack. Selected to fit your classic wing flies for full goose, or married wings. a .5 gram pack of hand selected feathers averaging 48 feathers a pack. Natural Chucker Partridge in a 24 select feather pack. A fantastic wet fly feathers. 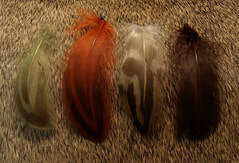 This 48 hand selected pack of Starling feathers make a perfect pack for your smaller wet flies. they also make great eyes on spey flies and larger soft hackles. 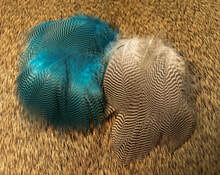 Select spade feathers in colors to cover most dry patterns and compliment popular colors of genetic saddles. 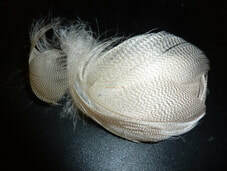 The fibers on these feathers are long and very stiff, perfect for tailing. 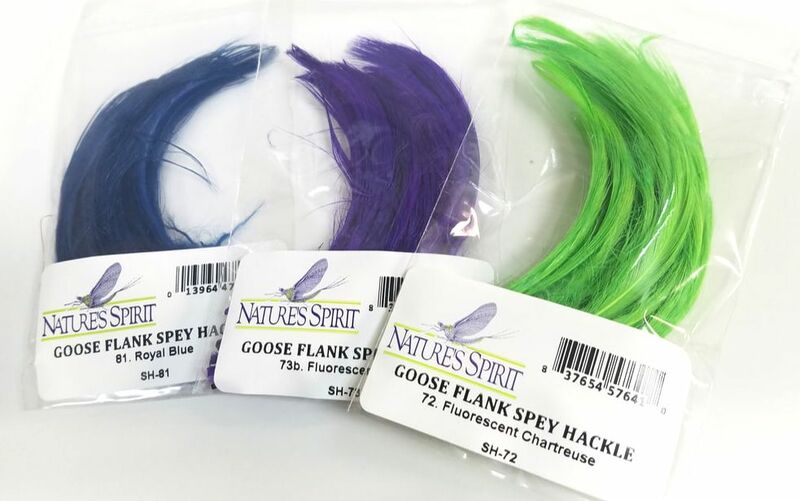 We are really excited about these large, webby feathers which have a minimum of taper making them ideal for collaring your favorite patterns. Suitable for a hook size range of #2 to #8. They will typically provide as many as 5 or 6 turns of hackle. These plumes are as nice and fluffy as they get. 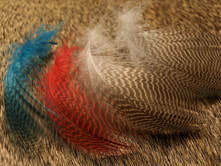 We hand select each one choosing only the plumes that we would personally want to use. A must have for anyone who ties buggers.